So one of the highlights of my trip was going to be covering DC’s own Wale at the Jazz Festival. Not only would I be in the area while DC was being represented to the fullest in another country, but I can also see how people outside of the DMV respond to the go-go sound that Wale has been dropping during his tour. I still don’t know why he decided not to come to Montreal. Contract issues? Money? Laziness? Who knows. 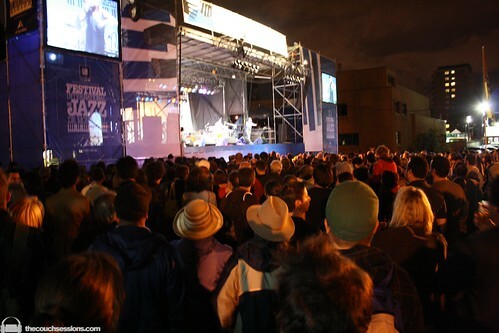 The Photo Above is the stage that Wale would’ve played if he came to Montreal. The Bell Stage area can easily fit over 40,000 appreciative fans, and from all of the DM’s I got the morning of, Montreal was more than ready to hear that go-go swing. I’ve heard go-go more than once during my trip to MTL–they love it here, even if they don’t exactly know what it is or who the main players are. Even more reason to educate the world on DC’s premiere musical form. Go-go should come to Montreal. The Jazz Festival should really look into booking Rare Essence next year, or even the man Chuck himself.